Couple of days ago I went to my regular 1,5 hour hike on the nearby Kalvarija hill at Maribor city in Slovenia where I currently live. It was a warm sunny spring day and I decided this to be my first barefoot hike of this year. There are grapevines planted all over that hill and several week ago they trimmed them and left excess twigs piled along the bottom footpath where I usually start the hike. Usually the piles of wigs were removed soon after cutting but this time they have mulched and spread across the whole width of the path. When I walked barefoot over the part with mulched twigs it was quite painful and I became angry at the vine caretakers who obviously did not think about how the path would now become troublesome for barefoot hikers. During the hike I noticed that my right knee became more and more painful and towards the end of the trip I almost started to limp. The pain persisted through the whole next day so I decided to schedule a session with one of the kinesiologists at Desteni who are trained in pointing out the exact mind patterns that cause the pains in human physical body. The first available session with a kinesiologist was the following afternoon. In the mean time I had a short chat with my flatmate who is also walking Desteni I Process course for self-realisation. While talking about what could be the cause for the pain in my right knee besides resentment towards the vine caretakers I remembered also another business related event from the previous day. And when I went to bed that evening, I kept the palm of my right hand over the painful knee in order to alleviate the unpleasant experience. The next day I had no more pain and when I had the kinesiology session, the practitioner asked what my problem was and what I think could be the cause for it. While describing both theories that I was able to think of, she pointed out that it was the business related event that was the cause of the pain thus I am now writing this post to look deeper in this point in order to pay it all the needed attention for not to be triggered again. I have been a leading promoter of Spurt debt-free global currency for more than one year now and the moment when it will become fully convertible to other currencies is approaching fast. Individuals will be able to pay off all debts, self-liquidating line of credits for housing and sustainable projects will be available thus it is a social currency, partially something like Equal Money System that I have been also promoting for the last 6 years. It is planned that all Spurt users will eventually receive MasterCard or Visa debit card that will enable them to pay for the groceries and other monthly expenses directly in fiat currencies. Recently the Spurt management announced that those who have opened their Spurt accounts before January 1st 2017 will received debit card with 5.000 EUR and those who will open their Spurt account by the end of March 2017 will receive debit card with 1.000 EUR preloaded, without any subtraction from their Spurt account balance. So Spurt company will basically give this money as a reward for being patient until the Spurt will become fully convertible. And the only thing that is needed to open Spurt account is to send 50 EUR deposit via PayPal or bank transfer that immediately converts to 50 SPU and to fill out the online registration form. When reading about this news I could not believe it since who would just give so much money for any new currency user without any other additional requirement. But just to be completely sure I called the Spurt director and had a Skype chat with her. She confirmed this fact but also expressed worry that this offer could attract many greedy people who will not understand the value of Spurt and how to directly use it to do business without need of being convertible at all. She wanted me to promote Spurt in such a way to firstly explain all other benefits of using Spurt and only when they see the value in it shall I also inform them about additional bonus in form of prepaid debit card. I think that requirement then triggered a massive polarity backchat within me where I wanted to tell the whole word about how they can generate 950 EUR profit by investing only 50 EUR however they would before that need to firstly become excited about the sole value and usability of Spurt. And the challenge is also how to persuade others to open their Spurt account without being able to tell any kind of date when Spurt will become exchangeable and when exactly debit cards will be available. The polarity backchat in my mind that triggered was thus about where on the one hand I accessed feelings like joy, excitement, cheerful, hopeful, creative, daring, fascinated, stimulated and optimistic and on the other hand I was experiencing emotions like scared, helpless, anxious, bewildered, insignificant, inadequate, embarrassed and overwhelmed. Because one downside of all this is that some people have already behaved nasty and have been frequently sending me messages asking about when Spurt will become convertible. And the other point is that I wish for everyone to be informed about this opportunity in order to profit at least 950 EUR but due to limited time and capacity I will be able to reach only several thousand people among 7 billion humans on this planet. In regards to that fact I have created a believe that I will be personally responsible for lose of profit for everyone that I will not succeed to inform and effectively convince to open their Spurt account by March 31st 2017. So I have become happy about the good news however thinking about how to deliver and perform to achieve desired outcome created overwhelming self-criticism related to perfectionism. I forgive myself that I have accepted and allowed myself to become overwhelmed by thinking about the upsides and downsides of a Spurt business opportunity due to my belief that this is a special opportunity that will permanently solve economic problems of humanity. I realise that despite of marvellous promises how Spurt will be able to deliver in the future it is not the one and only solution to current global problems as many other alternative currencies are being developed and there are massive actions being taken like global currency reset and neutering of the malicious banking leaders. I commit myself to when and as some amazing news is announced by Spurt management and my mind start to produce thoughts like: “Wow, this is so fantastic that I have to immediately tell that to whole world or I will be personally responsible to cause harm to others due to leaving them ignorant about this!” to stop and breathe. I then engage in promotion of great news with awareness that any news will have a limited reach and that whatever solution will be offered it will not be able to miraculously solve all our problems since we all must change all of our mind patterns for which it takes a lot of time and persistence. I forgive myself that I have accepted and allowed myself to have a tendency to present news in a way where I give it much bigger meaning that it actually has due to my pattern of trying to impress others and in that way receive their attention. I realise that by such action I create attachment where I try to control how others will respond and consequently also the fear of being judged by others if they will not recognise equal value in the information that I am bringing to then. I commit myself to when and as I receive some information where others may benefit from and my mind produces thoughts like: “I have to inform everybody about it immediately with great enthusiasm and let them know how valuable I am as a person who is bearer of the most awesome news on this planet!” to stop and breathe. I then consider all of my options, my limited time, the minds of others, their limited time and share any good news as factual as possible without any personal desire for attention from others. I forgive myself that I have accepted and allowed myself to suppress myself by repeating a pattern of creating polarity energy reactions of good and bad feelings where I would get excited and experience uplifting positive energy by imagining amazing future situation and then soon after that experiencing a heavy depressing feeling due to imagining what all hard physical movement, technical problems, refusal and criticism will I probably experience while trying to manifest the Utopian world. I realise that a better future for all is definitely possible however in this dimension of physicality and time it takes patience and persistent movement of many individuals who work together as one. I commit myself to when and as I am introduced with a vision of idilic future where we all live in harmony and abundance and my mind is producing thoughts like: “This will never happen since I am just a individual among many other people who will have little to no effect on this world so why even give it a try.” to stop and breathe. I then consider all the options to improve this world with awareness that if I collaborate in a global group where we share the same principles a synergy can be created and effects of my work will be multiplied many times over resulting in powerful global transformation where desired change can be manifested with great certainty. I forgive myself that I have accepted and allowed myself to overthink when dealing with life challenges where I go in my mind and allow all sorts of imaginations and thoughts that separate me from what is here. I realise that while imagination can be used constructively and self-directed thoughts are supportive, nothing within my mind will become true if I do not ground myself sufficiently and take practical action in this physical world. I commit myself to when and as I want to find a solution and I notice that I am only constantly thinking about positive and negative future possibilities to stop and breathe. I then use the mind only for initial stage of imagining things and follow through by making physical notes, action plans, calendar appointments, reminders and timelines in order to gain stability in the attempt to effectively manifest my goals in this physical reality. 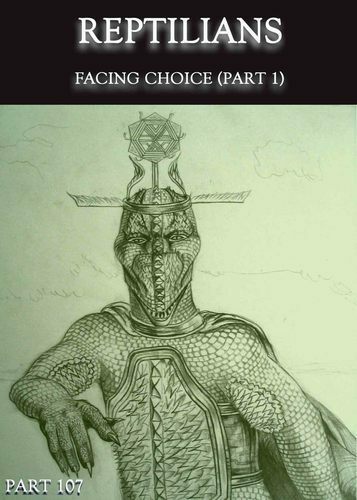 In relation to this blog post, I invite you to assist also yourself with awesome self-perfecting tools within free online DIP Lite course and to listen to educational audio titled Facing Choice from the Reptilians series at Eqafe web store with hundreds of extremely supportive educational items that hold answers to any imaginable question about life and this existence.